KD is coming to KC. Last time around we didn’t go. 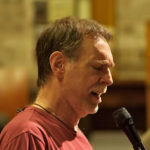 It was billed as a “concert” and held in (admittedly beautiful) Unity Temple on the Plaza—not in a yoga studio or high school gym, places where we’ve had previously the pleasure of joining him in kirtan. This time it’s billed as a kirtan—and though the location hasn’t changed we got ticket numbers 3, 4 and 5. Mere Guru Dev is a rock, grounding and solid. Yet this duet is gorgeous—thanks to the appearance of his daughter.